Three main factors determine the best way to access funds while traveling in Costa Rica. The most convenient and economical way to carry and spend money would be to just stop by your bank at home, get $5,000.00 in U.S. cash and stick it in your pocket. Obviously this doesn’t score well on the security scale. The best way to access your funds while traveling in Costa Rica depends on your budget, length of stay, current credit card debt, and mathematical ability. Get the most for your money with a good general plan including three parts. If you only have exactly enough money to cover your trip, spend this reserve over the last few days. Second, keep the bulk of your funds in your checking account at home. Withdraw enough dollars or colones (most machines offer both) to cover three to six days at a time from ATMs using your debit card. Pay for things priced in dollars with dollars (typically more expensive items like hotels, tours, upscale restaurants and overpriced drinks at beachfront bars) and pay for thing priced in colones with colones (typically things like hostels, small local restaurants and groceries). Third, use credit cards for major purchases (if no cash discount is offered), for rental cars when you want to use the credit card insurance coverage, and for emergencies. See the specific details about credit/bank/debit cards below. Bank or debit cards in an ATM are the recommended way to access your funds while traveling in Costa Rica. Except a few remote beach and wilderness areas ATMs are easy to find. 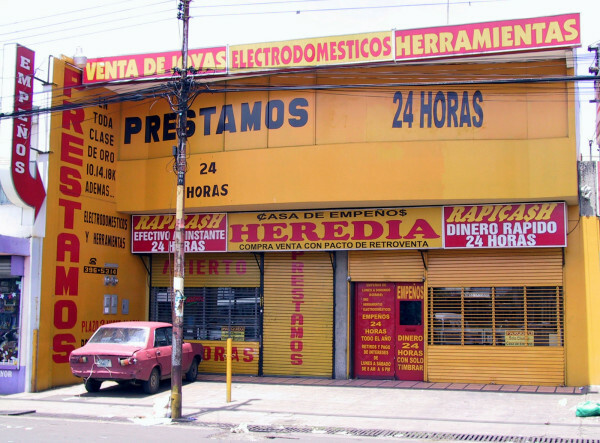 You can get cash at a pawn shop (casa de empeños) but we don’t recommend it. Check with your bank before you travel to ensure that they charge reasonable fees and you will find that ATM access to your checking account is faster and cheaper than traveler’s checks, safer than carrying large amounts of cash, and less nerve-wracking than dealing with unpredictable credit card fees. You’ll also be able to take advantage of cash discounts at many places that accept credit cards but only with a surcharge. The PLUS system is the most widely distributed international ATM (CIRRUS is available at many major tourist destinations). Debit and Bank cards are convenient, safe and quick. You’ll generally pay between 0 and 1% exchange commission, plus flat fees of $US 1-3 per transaction. 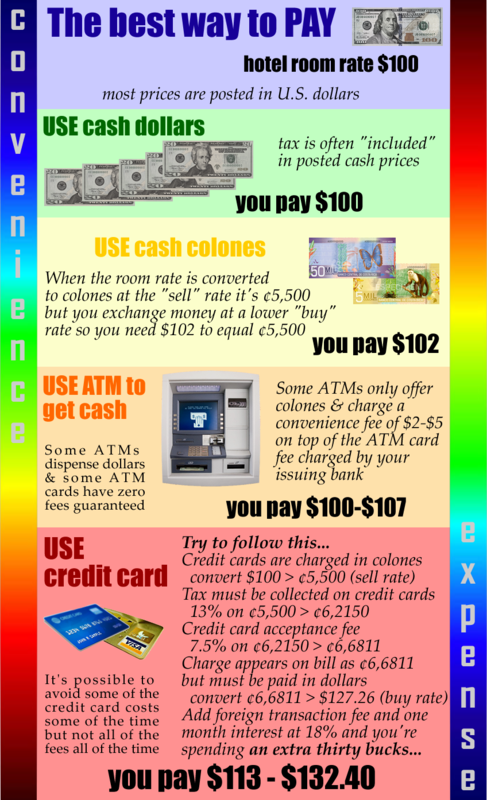 In addition to the general common sense practices for using cash machines (don’t go alone at 2:00 a.m., withdraw $500, and then stand next to the machine counting it out loud) there a few others specific to traveling in Costa Rica. Before you leave home, check with the card issuer to determine exchange commissions, convenience fees, and to get a list of machines that are within their system in Costa Rica. If you are having trouble with a transaction be careful about repeating it because the machine may confiscate your card. Chip card technology is slowly being introduced but many cash machines are not equipped to recognize them and may confiscate or deactivate them. It’s a good idea to have two different ATM cards. You’ll have a better chance of matching the local system and avoiding fees, you’ll have a backup if one card is eaten by the automatic teller, lost, or stolen. Sometimes even though the signs all say it will a particular card just won’t work. You are a long way from home and communicating with your bank to verify the transaction is more difficult and they aren’t going to give you the money and try to work it out later. Always try to use machines that are within your system (Plus, Cirrus, etc.) to minimize the transaction and convenience fees. It’s typically most cost effective to withdraw the maximum amount allowed (typically $US 300-500 in Costa Rica) because convenience fees are per transaction. We carry a Charles Schwab bank debit card that guarantees we will never pay an ATM fee in Costa Rica or anywhere else in the world. If there is a fee applied to the transaction by the local bank or ATM machine system, Schwab refunds the amount of the fee to our account at the end of every month. There are other online banks that have similar offers, but be sure to read the fine print. Credit cards have the largest range of variation for total cost of transactions. Depending on your card company and personal financial situation you may pay transaction fees, a “discount percentage” (sounds good but it costs you money), convenience fees, ATM fees, exchange commissions, interest, and penalties for each credit card transaction. Check with your credit card company in advance to find out which will apply to you. Where they are accepted, credit cards are sometimes a good way to pay for large purchases. The exchange rates are typically very good. If you have a card where you don’t carry a balance (you pay it off every month), check your card’s commission structure in advance, and ask about cash discounts credit cards can be the best way to pay. Using credit cards for cash advances (available either at ATMs or from tellers) can be expensive business. Some cards have costs as high as 102% for cash advances. We’ve seen agreements that state the fee is $20 or 10% of the amount whichever is greater and interest begins to accrue the instant the withdrawal is processed. So taking out $20 would result in a $20 fee and at 24% per year another 2% in interest or $40.80 on the billing statement. On the other hand, we’ve personally used credit cards to obtain cash at better than the posted exchange rate with no fees or interest (we pay an extra thousand dollars or so to our card account before we leave and our “cash advance” never creates a negative balance on our card). We carry a Chase Sapphire VISA card that guarantees there will never be any foreign transaction fees added to our purchases. There are others available, but be sure to read the fine print. Every time you buy something with your credit card, there is a 3-10% surcharge included. You never see this charge on your bill or receipt because in the US, Canada and Europe it is embedded in the cost of the item you are purchasing. In Costa Rica you will often see discounts for cash (familiar if you’ve bought gasoline in the American Midwest). This is in recognition of the credit card surcharge. Additionally some cards charge international transaction fees of 3-5%. Don’t get upset with the merchant in Costa Rica. These fees are charged and collected by your credit card company and in the case of the international transaction fee the merchant does not even have access to information about whether your company will charge you or not. Check the fine print on your cardmember agreement or call the tool free customer service number on the back of your card. VISA is the most widely accepted card, and the PLUS system is best for ATM availability. Credit card transactions are very convenient, and will cost you between 0 and 18% in fees, plus whatever interest and penalties you might incur. Know before you go. When spending cash you’ll get the most for your money by paying in dollars when the price is posted in dollars (usually higher priced things like hotels, tours and upscale restaurants) and paying in colones when the price is posted in colones (smaller items like taxis, sodas, food stands and local bars). United States dollars are widely accepted (though not universally, always have some colones, especially for smaller purchases). Carry twenty-dollar bills in good condition, without writing or tears. Larger bills are regarded with a great deal of suspicion and the new counterfeit resistant currency is only slowly gaining acceptance even years after its introduction. Do not exchange money outside the airport or on street corners. There is no “black market” for dollars as in parts of Eastern Europe or Asia and the only thing you’ll get changing cash on the street is ripped-off. It is ill advised to carry large sums of cash in Costa Rica. Local currency is the most convenient for everything except large items like resort bills, airline tickets, and tour charges. Even when credit cards are accepted there is often a discount for cash. Unless you’re hard and fast on the tourist trail plan to make most of your small purchases in colones. Choose a method to get the money from home converted into a few days worth of cash at a time. Generally a pain for anything but an emergency back-up. Fees for purchasing travelers checks are typically 1% although some credit cards and bank accounts provide them for free. You can sometimes spend them at upper end hotels and restaurants, but their exchange rate will be 2-3% worse than bank or ATMs. You’ll usually do better to cash a lump sum every few days at a bank. Bank costs for exchanging travelers checks are around 1%, sometimes with an additional flat fee of $US 1-5 per transaction. Banks are typically open from 9:00 a.m. until 4:00 p.m. but try to visit in late morning to avoid before & after work and lunchtime rushes that can cause long lines. Your passport is required-sometimes copies are accepted. US dollar checks from American Express are the only type that is widely accepted. Travelers checks will cost you between $US 1 and 7 per $US 100 spent, and consume about thirty minutes to three hours of your vacation each time you need to locate a bank and cash them.